Slow digesting protein that helps maintain muscle mass while you sleep. Chocolate flavoured protein powder carefully designed to perform while you rest. 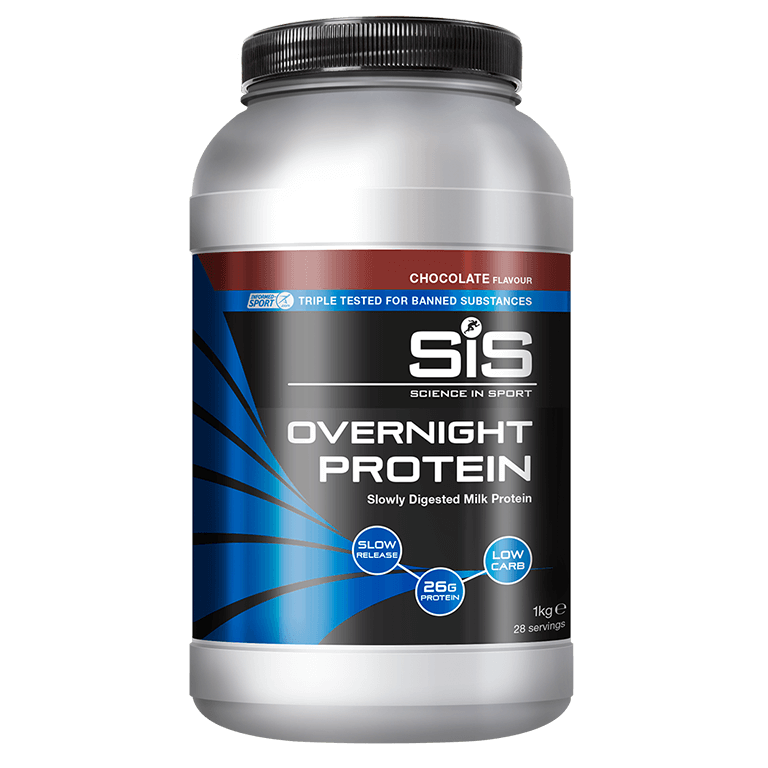 SiS Overnight Protein is made from high quality milk protein in a 50:50 blend with whey protein isolate for a great taste, providing a source of slowly digesting protein with a high amino acid profile to support lean muscle growth and maintenance as you sleep. Milk protein is over 80% casein, which is a slowly absorbed protein and around 20% whey, which is rapidly absorbed. Whey protein stimulates the rate of muscle protein synthesis with its high leucine content. Each serving contains 26-27g of protein per serving and low levels of carbohydrate and fat. SiS Overnight Protein should be taken 45-60 minutes before bed. Can be served hot or cold. Add 35g of SiS Overnight Protein to 250ml of water in a protein shaker bottle using the scoop provided. Shake well ensuring the lid is firmly closed. Consume cold or transfer into a cup and then heat in a microwave. Drink one hour before going to bed. Sleep is one of the most important aspects of recovery and is often unappreciated by many athletes. Regularly feeding 20-25g of protein every 3-4 hours is the best way to support the growth and maintenance of lean muscle mass. Feeding during the night is impractical, so taking SiS Overnight Protein before bed allows quality sleep and quality protein delivery to maximise your training adaptations. Why should I use this instead of SiS Whey Protein and REGO Rapid Recovery? What difference would it make? As we aim for 20-25g of protein every 4 hours, this is difficult to do when we're asleep. SiS Overnight protein contains milk protein, which is made from 80% casein and 20% whey. This is slowly released helping to maximise training adaptations and reduce muscle breakdown over night, without unwanted calories from carbohydrate and fat. Can I take this before/during/after exercising? Due to the slow absorption of SiS Overnight protein, we do not recommend that this is taken pre and/or during exercise. After exercise, SiS Whey Protein or SiS Advanced Isolate+ is ideal due to the rapid absorption rates. For maximum benefit, consume SiS Overnight protein an hour before bed. SiS Overnight Protein contains 26-27g of milk protein (depending on flavour). Add approximately 3.5 scoops to 250ml of water and mix well. Great way to recover, beats a normal night time drink or alcohol. Great when training hard. Have used this for almost a year now at the end of days when I've done a fair bit of activity. I wake up feeling ready to go again. Only used a couple of times but happy so far.